Monetro – A sophisticated and trendy sofa made from 100% natural leather. How would it look in your room? At csl-sofas, just upload your living room picture and move the sofa around!! Ever since Victorians started serving tea in the parlour, the living room has been the most public area of the house. It’s where you entertain guests. It’s also where you relax in the evening and on weekends, spend time with your family, and pursue leisure interests. Televisions, gaming systems, stereos and media collections are usually kept in the living room. Today, most living rooms need places to sit that will be comfortable for socializing, reading and interacting with a screen. Whether you’re relaxing on your own, with family, or with friends, the living room has got to be physically comfortable. However, it should also be a stylish and inviting space that you’re proud to show off. 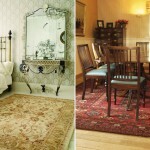 Ideally, a living room should be well thought out, and it should reflect your sense of style. After all, it’s the most personal space that you show to the world. You may use it to store and display the books, music and other media that you enjoy. The walls may show your family pictures or display art that reflects your taste and your interests. The Burlesque leather Sofa – A classic style with a modern twist. For a family, the living room says, “this is who we are.” For singles, choices about how to decorate and arrange the living room say a lot about both taste and priorities. Is it just a place for you, or is it set up with socializing in mind, as well? What About Your Living Room? Look at your living room and ask yourself “What kind of impression does this room make?” Is it neat and well organized, or is it messy and chaotic? Is it stylish, or is it frumpy? Does it have furniture and a layout that work for all the uses you put it to? If your living room isn’t a place where you enjoy spending time and where you’re proud to entertain guests, then maybe it’s time to think about redecorating. With its graceful cool pastel colours, this Cannes Fabric Sofa is oozing Elegance and style. If you have a saggy, stained, or out of date sofa or living room set, that reflects on you and your family. You may feel comfortable using it, but are guests going to feel as if they’re in a, well, broken-in private lair rather than a bright and inviting public room? A new sofa is a quick and easy way to brighten up a living room. It’s the piece of furniture that your guests will use most. Sofas today are designed for both comfort and style. They’re available in a wide range of materials, colours, and patterns. Arranging a living room set in a u-shape or semicircle can create a lovely social area that also allows for media viewing. The Halo Sofa with a combination of fabrics. 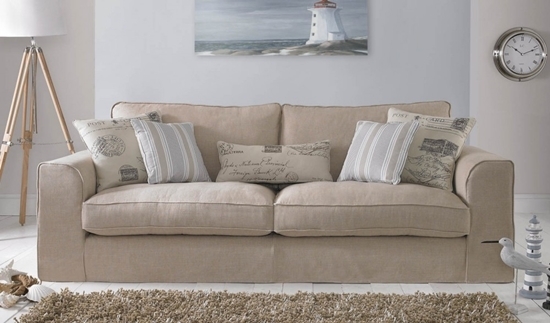 If you’ve chosen a subtle and elegant decorating style, then the sofa is the perfect accent piece. Choose one in a bright colour or with a lively pattern. If you have the space for a living room set, then consider one that’s coordinated, but not matching. Sofas and chairs with different patterns and textures can create a look that’s both casual and sophisticated. On the other hand, if you’ve got a richly coloured feature wall or distinctive wall paper, then you may choose a sofa or living room set that blends in and subtly enhances the room’s sense of style, whether it’s minimalist, contemporary, traditional, or shabby chic. A stylish new sofa – even a whole new living room set – may not be as costly as you think. When you buy from a company that doesn’t need to maintain or supply high street shops, you’ll find much lower prices. Sofas are available for sale on the web in an array of distinctive shapes, colours, and patterns. 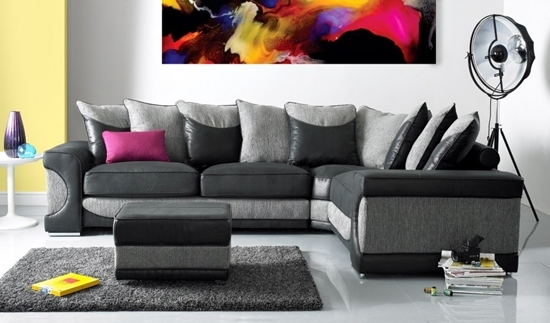 You will be able to afford a sofa you’ll love and be proud to have in your home. Oliver Bray’s interest in interior design was sparked by the refurbishment of his house a few years ago. Since then he’s evangelized on the affect our environment has on us and writes about the latest fashion trends designed to inspire your life.